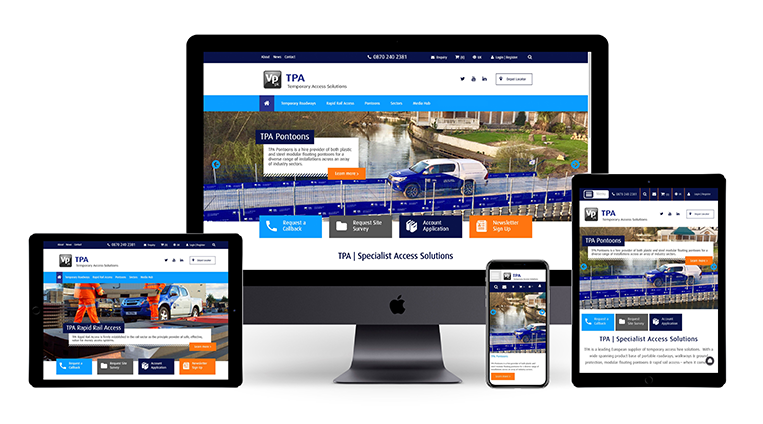 TPA Temporary Access Solutions have launched a new multi-branded user-friendly website. The new website will provide visitors with quick and easy access to all three unique temporary access divisions: TPA Portable Roadways, TPA Pontoons and TPA Rapid Rail Access. The clean and contemporary updated design makes browsing through the divisions and product ranges easier than ever. Additionally, the new site’s infrastructure and design will enable the company’s German division to benefit from the updates, with access to both sites using the country selector on the home page. The new site also offers improved navigation and functionality throughout, providing visitors with the ultimate user-friendly experience, and being 100% mobile responsive. Other key features include the TPA media library including: news, case studies, videos, plus social media links and updates. Additionally, the updated function to submit enquiries will assist in helping customers find out more about the range of services and products available. “I am really pleased with the end result of the TPA website. We have combined four separate websites into one. This simplifies our digital marketing strategy for both UK and Germany, and most importantly ensures our customers have access to any information quickly and easily from any device."